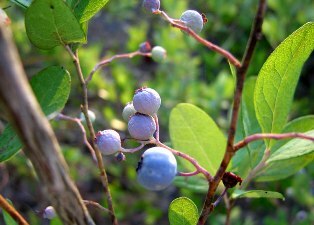 Dangleberry is plant of the Eastern United States. 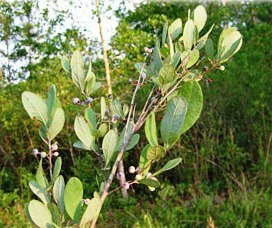 The plant is virtually a look alike of blueberry. A freely branched slender deciduous shrub, upto 2 m tall, with wide spreading branches. Flowers small, urn shaped, pinkish green, 2-4 mm long. Fruit fleshy drupe, glaucous, blue, 8 mm in diameter. Two varieties are recognized: Gaylussacia frondosa var. tomentosa has densely tomentose twigs, branchlets and leaf undersides. They are clothed with soft, matted, wooly hairs. Gaylussacia frondosa var. frondosa has glabrous twigs and leaf undersides, lacking the wooly hairs. This plant makes a great border shrub, staying under 1 m in height. Ideally, huckleberries should be planted along paths in the woodland garden where they provide flowers, fruit and structure in light shade. 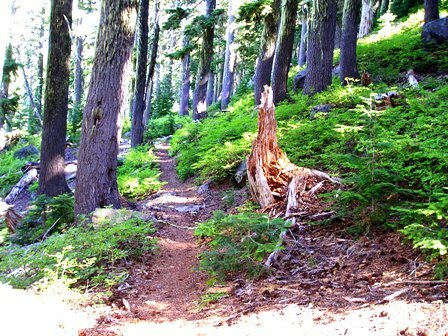 Like most members of the heath family (for example, rhododendrons and blueberries), dangleberries thrive in acidic soils. This plant likes a loose, organic, rich, well drained soil but not with a lot of fertilizer. It seems to thrive in poor soils. In nature this plant grows under shade. So, in home gardens, position huckleberry at a location where they get some afternoon shade. New plants should be raised from stem cuttings. The best results re obtained if these are planted in the mist. Though seeds also germinate but require a lot of cold stratification and therefore difficult as well as slow.